Hi, I am Elio Struyf. I'm from Belgium. I am working as a trainer for U2U and I'm also an Office Server and Services MVP. 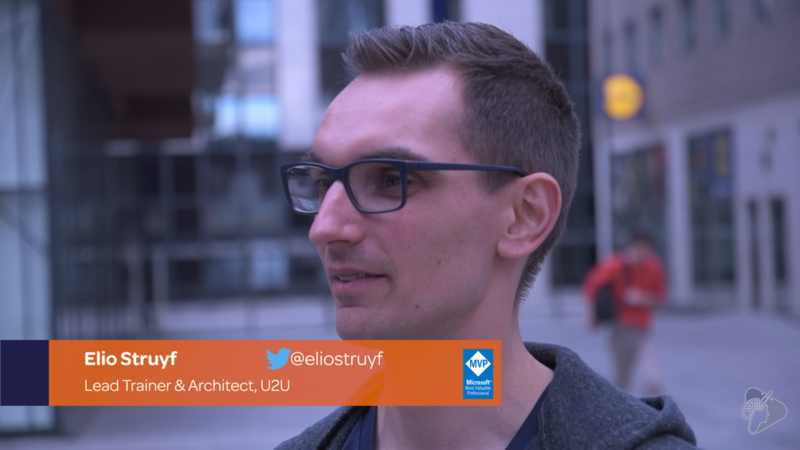 I started back in 2008 at U2U where I did the first training for SharePoint development, so it's a really funny story that I'm now working for the company where it all started for me. Then I started as a SharePoint administrator. For one year I did that and after one year I said no, screw administration, I want to do development, that was my real passion. After that, yeah. That's where it all started. Over the last couple of years I did a lot of branding in SharePoint and the last I think two or three years, I focused myself on SharePoint search and everything related to client-side development. I think the first time I got introduced to SharePoint Framework was back in the MVP summit two years ago where they showed us what was being developed behind the scenes and what we were expecting from it. The real codes was back in August with the first drop. Drop zero of SharePoint Framework and since then I started building my own web parts for this. I think in the first drop I created my own search for that part which mimicked the same things as you can do with constant search for a part. Templating stuff and building your own queries with it. Every time there was a new drop I had to create and update my application so there were some breaking changes so that's how I knew how the ins and outs of the SharePoint Framework itself worked. I really like it at the moment. Of course it has to evolve and it has to improve in a lot of things because right now we don't have the things we need as it was before. There's some co-parity that needs to be there before we can really say it's a real valuable SharePoint Framework for the new modern UI, but at the moment I really like it. It's a new way of working. It gives you a model where a lot of people are focusing on client-side development, but weren't sure what is the right way, how to do it. Now we have a uniform way where every developer will do it in the same way as the real developer for SharePoint. It's going quite fast. Maybe for me as a developer, I always want to go faster so I really want to play with it and I really want to go to production with it. The one thing I would add. I would add a new search web part coming from the engineering team and maybe that's just the part. I would like as they open up the Gulp and the webpack system. Right now you have the rig system, which is something they invented in Redmond. Normally Gulp works the tasks, but I would like to work in real Gulp way with tasks so that we can create our own build tasks and define, which tasks run and when. Now that they can say right now you have four entry points into the built system. If that wouldn't work for you based on some sort of reasons, normally you would do your own tasks set up with Gulp. That's something that's not possible right now. That's one thing I would change. I think the tools… you can say took a command line base. A lot of developers will say “oh no command line”, all of these black things… black boxes with white text on it, no I really don't like it. Of course, we have the Visual Studio extension right now that you can use, so no more black text, no more white text and black screens. For me, I think, or for the community, I think it will be the tools, getting used to Gulp, getting used to webpack and all these kind of things. We as a SharePoint developer weren't used to that. That will be a hard one. It's always difficult to say what the engineering team has on its mind, but I would say I hope, I really hope that in six months we have complete code parity and that there is a good solution for working with Angular because right now we can only work with React ,or React is the best solution to work with, but you also have a lot of developers that want to do stuff with Angular so I hope that there is a real valuable solution inside SharePoint Framework for working with Angular.